A cloud of smoke that could choke the Tennessee Valley hovered over one of the handful of men everyone seemed to know in Las Vegas in the early 1970s. His cigar tip glowed red and he had to decide what to do — either toss the jack that hung at the end of his lowball hand like a piano teetering out of a window attached by string to his incisor, or stand pat and put Johnny Moss to the test. Moss had already called an all-in bet by Pearson, assuming he’d be getting the correct odds, before a tight player they both assumed would call folded instead. Pearson knew he probably didn’t have the best hand. If the tight player called, he would’ve discarded that jack and hoped his one-card draw made him the winner. He also knew Moss knew that he knew — all poker players know what it’s like to be on that merry-go-round of terror — but Pearson knew the math that is never all numbers. “Well, I know what Johnny’s thinkin’ and he’s a good enough player to know that I know what he’s thinkin’, just like he knows what I’m thinkin’,” he told Jon Bradshaw for his mid-70s classic Fast Company. At his best, Puggy Pearson could take all those simple numbers knowing they change depending on the environment, depending on the hills and the streams and the kind of native trout that swim in them. Moss “pooches” it and draws. He made a mistake, he gave Pearson the edge. Pearson, a son of a rock crusher, knew the “environment” better than most PhDs. In the 1940 census, after the family moved to Jackson County, Tenn., his father’s occupation was listed as “rock crusher” for a W.P.A. project. Forced at 10 to get a job and help support the large brood of descendants from hardscrabble Englishmen, he did whatever a boy could find during the Depression — construction, gofer, bottle collector. His earned his nickname after showing off for some girls on a job site at a church. A floorboard broke while he was walking on his hands and he smashed his nose flat. At 16, Pearson joined the Navy. He missed World War II and found life in the Navy, with its monotonous days and all those nautical miles between ports, a perfect opportunity to make serious bank gambling. He learned how to palm dice and calculate pot odds. A pool hustler and a card shark, he stayed in the Navy for three tours because, he said, the action was too good to resist. Pearson on a boat with a deck of cards and the thousands and thousands of dollars in the pockets of bored men was like an eating champion at a smorgasbord. If he was as naturally good as hitting baseballs as he was at sizing up people, he would have been Ted Williams’ fat, slow cousin. And if Williams was good at short-changing the pot, palming dice, and angle-shooting, Williams would’ve been a Puggy. He scooped up more than $20,000 by the time he was discharged in the early 1950s and would never work at another real job his whole life. After the Navy, he spent about a decade based in Nashville, operating a small three-table pool hall called Pug’s and rambling around the country, playing cards, shooting pool and doing anything else he could do where he thought he had an advantage. 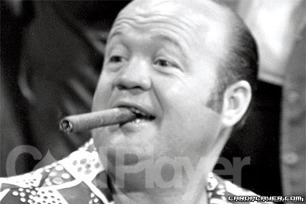 Pearson moved to Vegas in the mid-1960s where he quickly fell in with the people he’d spent a decade with driving the highways from game to game, pool table to pool table. He wasn’t the first big-time card sharp to make the city’s card rooms his “office” — Moss and Roberts beat him there, to name just two — but he soon was known as one of the toughest players and prop bettors in a town full of them. A scratch golfer, he was a legend on the course and would gamble for stratospheric amounts. During his prime, he could chip and putt as well as PGA Tour members. The most he won on the golf course in one day was $300,000, according to Jack Sheehan in an article for World Golf Magazine. Doyle Brunson also said he had to pick anyone in the world to make a putt with his life on the line, it would be his friend Pearson. Pearson would put in marathon card playing sessions, many going longer than 24 hours, a large stogie clenched in his puffy lips. When Bradshaw went to see him in the mid-70s, he noted how everyone seemed to know him. Waitress, casino employees, tourists, they knew who he was and had to stop and get a piece of Pearson. Pearson’s playing style was ultra-aggressive, or “wild,” as he put it. He thought of himself as the boss. If players wanted to win, they would have to go through him. He placed himself in the doorway like a cosmic bouncer. And he filled this role for a good part of 30 years. 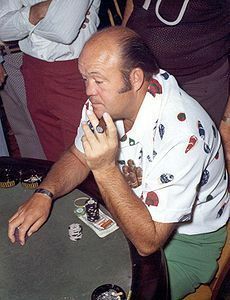 He won four WSOP bracelets but none after 1973, when he won three of them, including the $10,000 main event. 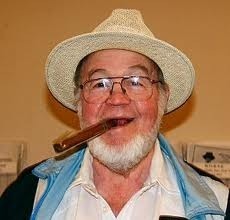 He didn’t miss a WSOP main event until his death at 77 on April 12, 2006.